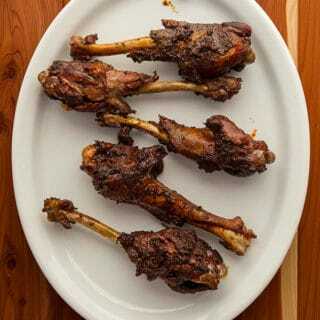 Smoked goose wings may change your opinion about what is and is not edible on a goose or duck. 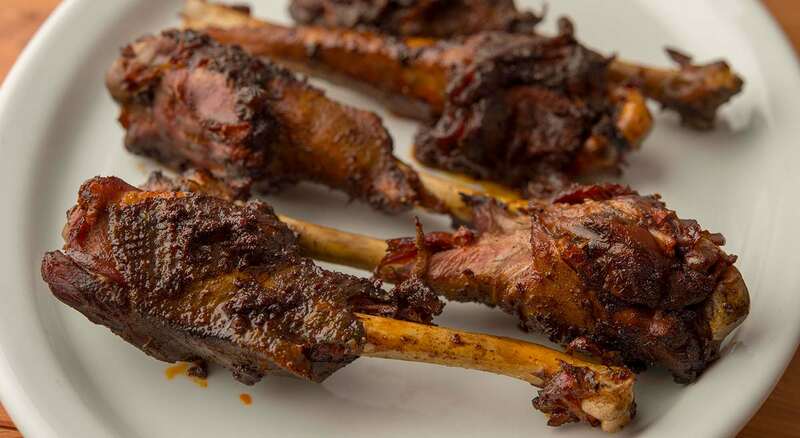 , which as you might imagine covers all things waterfowl, I include a recipe for smoked goose wings that basically turns them into an avian ham hock: Smoky as hell, but tough and in need of long cooking. Great with beans or greens. This is not that recipe. These smoked goose wings are for eating right away. You switch the process and simmer them into tenderness first, then smoke them, coated in the sauce or spice rub of your choice. I fell into this idea a while back with my recipe for smoked turkey wings, which does basically the same thing. Turkey wings are now my favorite part of that bird. Legs are still my favorite part of a goose, but I’d say these wings are a solid second. Ideally you would have skin-on wings, as the skin protects the meat from drying out, and because several muscle groups in a goose’s wing are solidly attached to the skin, so skinning them will cause you to lose some meat. If you do this with skinned goose wings, make sure your sauce has fat in it to coat the meat while smoking. I only do this with goose wing drumettes, the first digit of the wing. Turkeys have lots of meat on their second digit, but geese do not. The process is simple: Braise the wings until they are tender. Ideally you coat them in sauce while hot and let them sit in the fridge overnight before smoking, but you can do it without the night’s rest. Then you smoke for a couple hours to finish. What wood you use is up to you. I like mesquite with Mexican, alder with Asian, cherry or apple is always nice, as is pecan or hickory if you are going Southern. You can take your smoked goose wings in any direction you want: Mexican, Asian, Southern BBQ, whatever. Your flavors will be built in the simmering pot first and then with the sauce. In my case I braised the wings in a broth similar to my venison barbacoa, then painted them with Mexican salsa negra. But that’s just one example. You could drop some ginger, garlic and green onions in the broth, maybe with a star anise or something. Then coat the goose wings with, say teriyaki or Korean BBQ sauce or char siu. Or just simmer in chicken broth and paint with your favorite barbecue sauce. Here is a selection of sauces that would be fun to use in this recipe. This is a method for smoked goose wings where you can eat them right away. 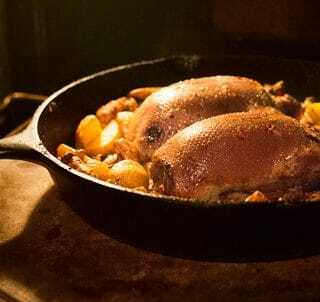 You can skip the simmering step and use these as a sort of ham hock, but then you will need to simmer them afterwards. Use any sauce or spice rub that makes you happy. Simmer the goose wings in water or broth until tender. This should take between 2 and 3 hours. Don't boil the wings, just simmer them gently. Set your smoker or barbecue to about 200F. Wood choice is up to you. Coat your wings - carefully, as they will be close to fall-apart tender - with the sauce or spice rub of your choice and smoke for 2 hours. Eat. NOTE: Prep time reflects the simmering time. Cook time is the smoking. You can find more than 100 recipes for all kinds and all parts of ducks and geese here on Hunter Angler Gardener Cook! Would running the wings through sous vide provide the same results as simmering them? Or must there be contact between the drumettes and braising liquid? Chris: Sure, you could do that, but then a) you would not also be making goose stock at the same time you are cooking the wings, b) it does not require any sort of precision, and c) there is no plastic involved in this method. Sounds delicious! My fiancee bought me duck duck goose for Christmas and I just happened to see your ham hock idea a few days ago. Cant wait to try some of your recipes!